One new hand tool specifically created for the new 9N Tractor, is the plow wrench. 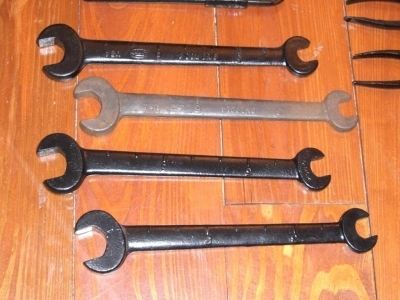 Several different types of plow wrenches have been found that pre-date the first 39 Ford/Ferguson 9N Tractor by a number of years, so it was not a new invention. The plow wrench was a tool unique to the Ferguson lift system, so that only one tool would be needed to make all necessary field adjustments for plowing. Many people have used the marks on the plow wrench to measure fuel level in the tank, but the marks do not accurately relate to gallons. They are obviously inch marks. Quite a few antique Ford Tractor and old tool experts insist that the plow wrench was also intended to be used as a fuel gauge. Some claim they were told this by Ford dealers back in the day. Some old tool experts claim that since the small end fits, and the large end prevents it being dropped into the tank, "this proves it was intended to be used as a gas gauge". I have no faith in a claim based on the wrench sizes that just happen to fit/not fit the fuel tank opening. So far, nobody has been able to provide a copy of any official documentation that refers to the plow wrench as a fuel gauge wrench, so I will continue to call it simply "The Plow Wrench" until somebody provides actual proof. Various warnings about explosions caused by cell phones at fuel pumps or sticking a steel wrench in a gas tank are complete fabrications based on bad information. It is simple enough to check any such warning with Snopes. The hype and exaggeration in these warnings are a complete distraction that do little to protect anyone from the real danger. FACT: gasoline or diesel fuel liquid does not burn or explode. The real issue is with fuel spills and fuel vapor. Any spilled gasoline or diesel fuel greatly increases the amount of fuel vapor in the area. Fuel vapor, in the right concentration with air can ignite, causing a brief flash fire. This flash fire can ignite clothing or other combustibles. Vapors in a container, such as a nearly empty fuel can may be ignited, causing the container to burst (explode). For this reason, a nearly empty fuel container, or tank is far more dangerous than a full one. The ignition source for any fuel vapor can be any spark, flame, or heating element that is hotter than the flash point of the vapor. Static electricity does not need a metal wrench, cell phone, or other device to occur. Under the right conditions (cool dry weather) all you need is the end of your finger to cause a painful spark sufficient to ignite fuel vapor. Getting in and out of a vehicle while it is being refueled can cause a static discharge when making contact with the vehicle (especially in cool dry weather). In most cases, it is nearly impossible to get in and out of a car without coming into contact with the vehicle enough to discharge any static electricity well away from the fuel tank. There have been a few documented cases where brief flash fires have occurred at fuel pumps and open fuel tanks. People have been burned. Fires have occasionally spread and caused significant damage, even explosions. However, in every case, the conditions under which the initial fire occurred required more fuel vapor than would normally be present, such as from a fuel spill, and a source of spark or ignition. Adding fuel from a can to a smouldering fire is not an accident, it is stupid. Fuel vapor from the can will be ignited, flash back to the can, and probably badly burn the idiot, especially if they manage to slop fuel on themselves. This type of stupidity happens far more often than any accidental flash fire. To return to TOOLS page click HERE.